The first time Blue Grass Boogiemen and I spoke about filming a session must have been about four or five years ago. Somehow it didn’t happen earlier than late 2013. With 9 songs in this session, the band from Utrecht, The Netherlands made it worth the wait. Last year they released their latest record Delivering The Grass on Excelsior Recordings which shows them in great form. Lucky Fonz III once said that he’d love to have Blue Grass Boogiemen in a small box at his house so that he can open it up and have them play live for him every day. Let’s face it: who wouldn’t? With nine songs, it’s the session with the most songs in the history of Onder Invloed so far, and I even had to leave a song out due to technical reasons. These 23 minutes are sure to lift your spirit, if only because of the visible joy these men have playing the music of their influences. Seeing them play live is always an experience, and I’ve seen them many times over the last I don’t know how many years. It’s good to see them get more and more exposure over the years, because they sure deserve it. 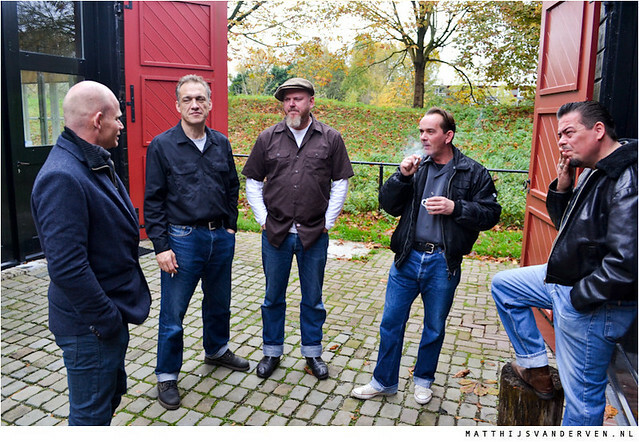 We filmed this session at Fort Aan De Klop in Utrecht, a great old place to have a drink.